Life may take an unexpected twist….. 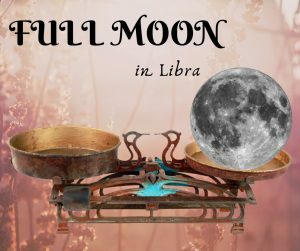 This is the second Full Moon of two in Libra this year (the first one occurred on 21st March at the very beginning of the sign whilst this one is at 29°06’, a critical “all-or-nothing” degree when the planet involved expresses the sign it’s leaving in its fullest manner. The lunation is also conjunct (Sun) and opposed (Moon) to Uranus which has only recently entered Taurus (the other sign of the dispositor of the Moon) hinting that things make not work out as planned. Venus the dispositor of the Moon is to be found at the end of Pisces leaving the confusion to hopefully find some direction in Aries. Mars, the dispositor of the Sun is in the social sign of Gemini and will be OOB from the day after the Full Moon (20th April) to the 12th of June making for a high energy, over-the-top Mars as it runs through Gemini and Cancer. Forcing your ideas on people, moving too fast for your own good could be things to watch for as it continues its journey through Gemini whilst being careful about passive-aggressive behaviour and defending your tribe could be some themes as it travels through Cancer. To wrap it up: the you/me emphasis of this lunation may bring some surprises with it, YOU may be unexpectedly frazzled whilst I may already know the direction in which I’m heading, well at least I may have a plan for it! While Aries loves challenges and initiations, fighting for them if necessary, Libra, a Cardinal Air sign, wants partnership and prefers fairness and justice in all relationships, but these are also values that can be fought for too. What do we value most, ourselves or our relationships? And again, are we reflecting our true selves in our relationships or are we making do and letting fear make us possessive and jealous? Author Raven Kaldera calls it the “Artist’s Moon” according to him, it’s a great time to start creative projects and an even better time to pick up those creative projects you’ve put aside or forgot about or lost inspiration in. It’s also a good time to go public with your art (or your talents I might add). The Sabian symbol for the Moon at 30° Libra: “Three mounds of knowledge on a philosopher’s head.” Indicating the fulfilment of man’s power of understanding at whatever level of existence the person operates. For the Sun at 30° Aries: “A duck pond and its brood.” Indicating the realisation of natural boundaries.